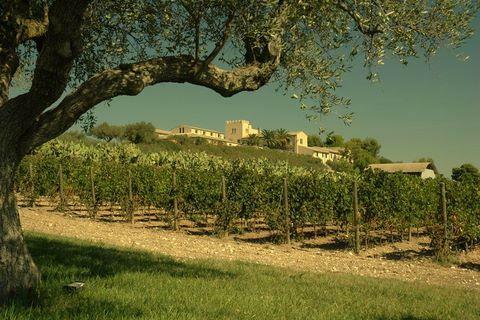 The Morgante winery represents one family's initiative to employ five generations of viticultural experience. In 1994, Antonio Morgante, with the enthusiasm of his sons, Carmelo and Giovanni, decided to vinify their vineyard grapes. This decision represented the beginning of a strong commitment to achieve the best results with indigenous grapes while keeping an eye toward innovation. In 1997, the family hired Riccardo Cotarella as their winemaker. Cotarella, widely recognized for his work crafting compelling wines from Italy's native varietals, shares the Morgante passion for producing great red wines from Nero d'Avola. Wine Spectator 89A creamy, medium-bodied version, with aromatic hints of tar and melted licorice, offering supple tannins well-knit to flavors of baked raspberry and black currant fruit. The 2015 Bianco di Morgante is Nero d'Avola made off the skins as a white wine. The wine's appearance is almost totally transparent and void of color. The bouquet opens to light tones of peach and citrus. It is heavily defined by drying mineral tones as well. The mouthfeel is thin, lean and crisp.